Since the early 1980s, Erik Belgum has been working in the field of sound poetry, electro-acoustic music and live performance. 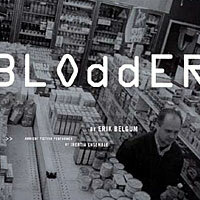 Released on CD in 1999 by Innova, Blodder contains seven tracks of spoken text in the cut-up tradition of William Burroughs and Brion Gysin. Some of these pieces are solo rants, others feature numerous different voices layered over each other simultaneously–which, if you ignore the actual language, could be a nice launching pad for an excursion into pure sound–and yet others include static electronics simmering in the background. The subject matter features a botched convenience store robbery, a fatal car accident, a hospital patient’s TV commercial obsession, “the eviction of a divorcing couple from a gaseous and explosive environment” and general social dysfunction delivered in a chopped-up, mixed-up manner that is at once harsh and hilarious, not to mention desolately lysergic. This is definitely a good one for fans of Burroughs, Gysin, Robert Ashley and sound poetry in general. You are currently browsing the archives for the Erik Belgum category.